At $3.5T in size, the auto industry is a key driver of the global economy. The US is still the world’s largest market, with auto sales and aftermarket services estimated at $1.2T. The US retailing model, centered around the auto dealer, has remained surprisingly resilient during the 33% upswing in auto volumes, now entering its 10th year of expansion. 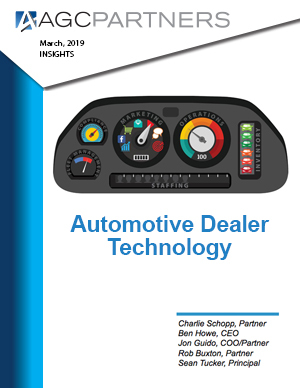 Dealers have invested heavily in tech to offset shrinking profit margins. Auto dealers were early adopters of digital advertising, a trend that shows no sign of slowing. At $14B, automotive is the second largest digital ad market of any US industry, and at +27% in 2017, it’s the second fastest growing. Auto dealers were late adopters of cloud based software, but that’s changing rapidly with AI in particular as a potential means of uncovering and reclaiming lost profit opportunities. Enterprise software is now a ~$10B market in the autos vertical. While still dominated by the big three legacy players (Cox, CDK and Reynolds and Reynolds), new PE-led platforms have emerged to challenge those incumbents.